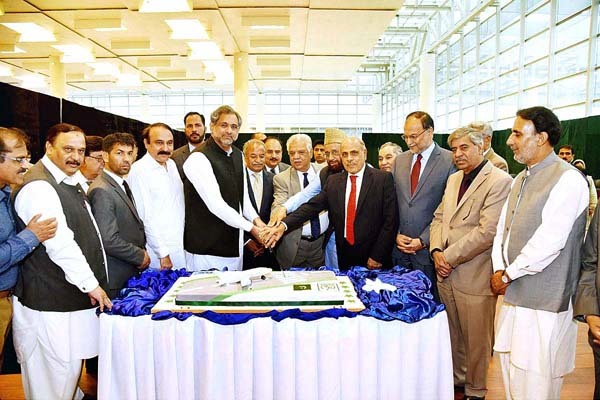 ISLAMABAD: Prime Minister Shahid Khaqan Abbasi on Tuesday inaugurated new Islamabad International Airport. The prime minister was accompanied by the governors of Khyber Pakhtunkhwa and Punjab, Adviser Civil Aviation Sardar Mehtab and the Mayor Islamabad. Speaking at the ceremony, the prime minister attributed the success of the project to a strong democracy, respect for the Constitution and determination of the Pakistan Muslim League - Nawaz govt in serving the masses. The prime minister said the PML-N achieved in mere five years which was unprecedented in the past 65 years, since country''s existence. He said 1700 km new motorways, 10,400 MW, and the end of demand and supply gap in provision of electricity and gas has been fulfilled. The prime minister commended the Civil Aviation Authority on completion of the gigantic task and asked it to gear up efforts for provision of service of international standards to the passengers. He said Pakistan has the most liberal aviation policy and protectionism was not a solution. Abbasi said there was a need to further improve it to encourage new local and foreign carriers. He said aviation today was a necessity and not a luxury and there was a need to ensure provision of best services that encourage the aviation sector. The premier also asked the CAA to ensure that the issues that might crop up in the early phases of the new project be dealt with on priority. He said all new projects have issues that need to be addressed, to avoid inconvenience to the people and complaints. The airport is slated to be one of Asia's major aviation hubs and a destinations. 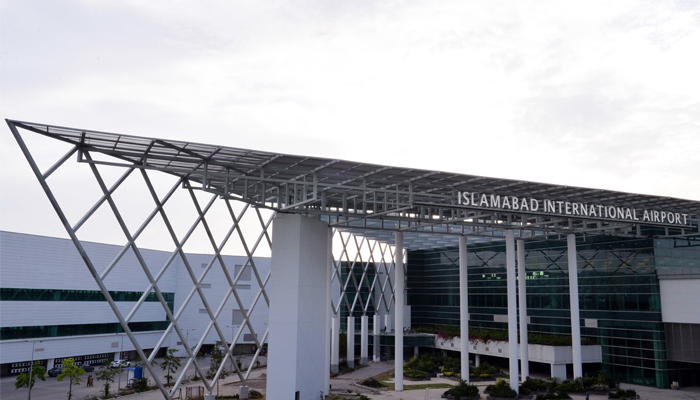 Islamabad International Airport is designed by French company Aéroports de Paris Ingenierie and CPG Corporation of Singapore. It is built on 4,238 acres of land and consists of 4-level passenger terminal building, 2 runways, taxiways, apron, parking bays for wide-body aircraft. The first flight of Pakistan International Airlines (PIA) from Karachi landed at the new airport at 11am, while the first flight of the national airline will depart for Karachi at 12.30pm. There is a cargo terminal, air traffic control complex, fuel farm, as well as a fire, crash, and rescue facility. It is fully equipped to handle all types of aircraft including the new generation aircraft such as the Airbus A380, Boeing 747-8 and Airbus A350 XWB aircraft. The airport is connected to Islamabad and Rawalpindi via the Kashmir Highway and Motorway via Thallian interchange with the link to the proposed ring road. A four-lane highway has also been constructed by NHA to cater cargo traffic. The Islamabad Metro bus project is also being expanded to connect the airport but the work is still underway on the project. Being the first Greenfield airport, a significant portion of the land has been earmarked for the commercial purposes such as duty-free shops, 5-star hotel and convention center, branded coffee shops, business centre, food courts, multifunction shopping mall, theme park, cinemas, golf course and other leisure/recreational facilities. It took almost 11 years to build the new Islamabad International Airport after the ground breaking in April 2007. The 4-level passenger terminal building is 190,370 square metres specifically designed to facilitate passengers and stakeholders and is completely high-tech and fully computerised with integrated systems of international standards. 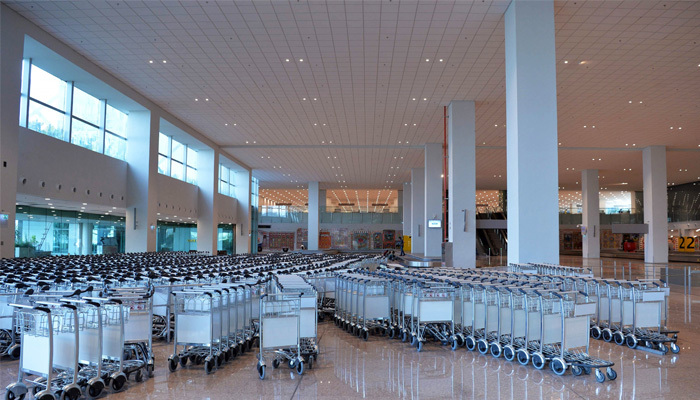 The airport is also equipped with the latest facilities like 15 Contact Bays/Passenger Boarding Bridges including 9 International, 5 domestic and 1 swing gate. 13 Remote parking Bays for aircraft including 9 International and 4 domestic with 3 additional parking stands at the Cargo Apron and 2 parking stands at State Lounge Apron for travelling passengers, state guests and other stakeholders. The passengers making connections to other international flights are linked to the main international building with facilities like food court and other entertainment facilities like delayed flight lounges, prayer rooms, duty free shops and a transit hotel for international departure and transit passengers. 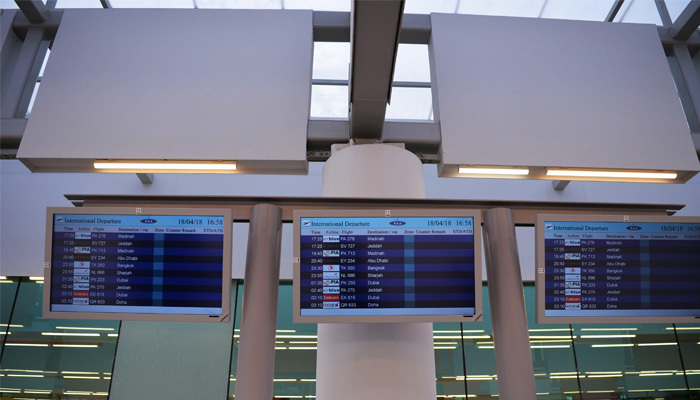 Latest technology available in the world, most state of the art Flight Information Display system is installed in domestic and international arrivals and departures lounges. 30 Immigrations counters in international departure lounge and 40 immigration counters in international arrival lounge, 72 international briefing counters and 32 domestic briefing counters are installed. The main car parking area for passengers has the parking capacity of 2,200 vehicles having 9 entry and 9 exit toll booths for all the international and domestic passengers. Other state of art allied services like Telecom Services Building, Bachelor Officer Quarters, Medical/Trauma Center, Mosque, Civil Aviation Authority Staff Accommodation, 2 Petrol Pumps (Airside & Landside), Police Station, Security Watch Towers, Out House, Cargo Complex, Custom Cargo Building, Airport Operation Control Center GED North / Log Centre North & MT, Fire Crash Rescue Building (FCR), Satellite Fire Station, Radio Radar Building (RRB), Telecom Services Building, ASF Camp, 132 KVA Grid Station. Water Works, Sewerage Treatment Plant have separate entrances and exits.